Last One Available - Assembled floor model - Full warranty. Packed with dynamic voices, as well as 100 professionally produced accompaniments, it also includes a multi-track recorder to capture all of your performances in luscious, expressive, 3D sampled acoustic grand piano sounds. 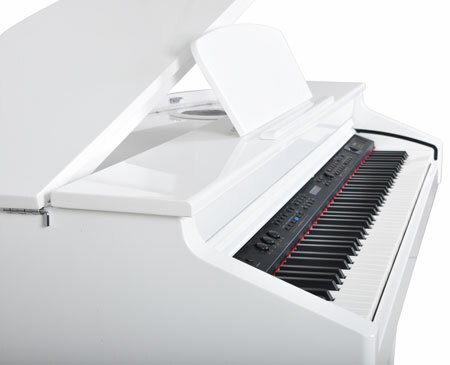 The Natural Acoustic Hammer Action Graded keyboard provides the authentic touch, weight and feel of a real grand piano. 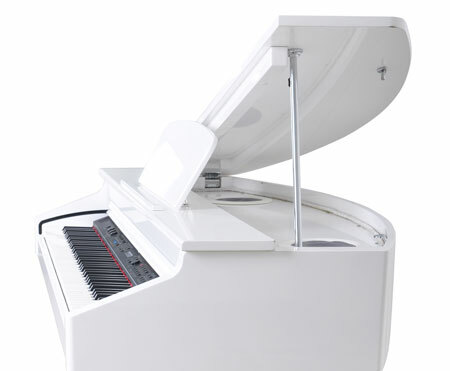 The DG-55 is digital piano and therefore never needs tuning. Additionally you can play with headphones without disturbing others around you. 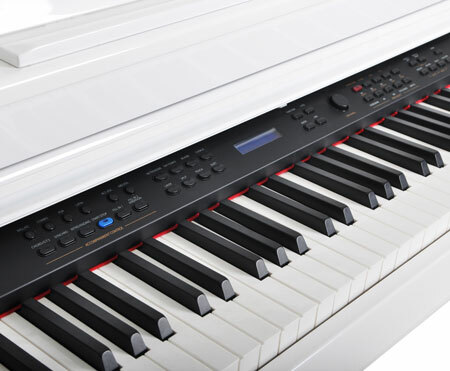 It has a built-in metronome and music recorder function, so you can practice, and record with a programmed time reference and listen back to your performances. Plus there are Stereo line In and Out Jacks that allow you to attach powered speaker monitors to enhance your current sound delivery system or listen to your MP3 player, or other audio device through the piano’s sound delivery system. The MIDI Out Jack plus the USB Port offer expanded capabilities for future enhancements. The DG-55 automatically produces full backing parts. It’s like having an expert band playing with you, following your every move and chord change. The DG-55 is Bluetooth compatible which allows you to play along with your favorite songs or turn your piano into a home entertainment center for the whole family to enjoy. Simply adjust your Bluetooth device (smart phone, tablet or laptop) to play through the DG-55’s powerful four speaker stereo amplifier system.